TANDAG CITY, SURIGAO DEL SUR--Manobo evacuees surprised presidential aspirant Mar Roxas with blunt answers to his questions when he visited an evacuation site last September 8, his last day in office as interior and local government secretary. Roxas visited his party-mate Governor Johnny T. Pimentel who brought him to the provincial sports center where about three thousand Manobos from 33 communities evacuated to escape the ongoing paramilitary operations that killed three of their leaders last September 1. Pimentel was leading Roxas to the main grandstand where majority of the evacuees have pitched their tents when the Liberal Party standard-bearer unexpectedly turned around and instead proceeded to a small tent nearer the entrance. The governor appeared surprised by Roxas’ move and stopped on his tracks before following his guest to the tent. Backslapping an evacuee as he entered the tent, a smiling Roxas asked the Manobos, "Why aren't you going back to Liang yet?" referring to the town of Lianga, the site of the massacre of three Lumad leaders. “Because there are still soldiers there, sir,” came a swift reply in Visayan from an evacuee. The governor then asked Manobo leader Bertolo Garay to narrate to Roxas the massacre of Emerito Samarca, Dionel Campos and Datu Juvello Sinzo in Barangay Diatagon in Lianga town this province. Here's the part of the Manobo refugee's interview with Roxas, translated from Cebuano to Taglish. Roxas: So anong nangyari dun? Manobo Refugee: Bale Sir dun sa aming mga komunidad, marami na 'tong mga komunidad, mga 30 na 'to na mga komunidad dun sa area ng Mapaso sa lugar ng mga tribo Manobo. So, andito ngayon ang karamihan ng mga Lumad dahil sa mga ginawa dun ng mga militar, sa tropang 6th Infantry Batallion at 75th, kasama nila ang mga tropa nilang mga bandido (paramilitary Magahat/Bagani Forces). Roxas: Teka teka, who are you? Cameraman: I'm from Veritas Manila, Secretary. The Manobo refugee told Roxas that lumads fled their homes in fear for lives, as AFP-supported paramilitary forces (Magahat/Bagani) murdered his colleagues in cold blood. Samarca was the executive director of Alternative Learning Center for Agriculture and Livelihood Development (Alcadev), a secondary school for Manobo youth, while Campos was the chairperson of the Manobo people’s organization Malahutayong Pakigbisog Alang Sa Sumusunod (Mapasu). Samarca was taken by members of the so-called Magahat/Bagani Forces, an armed group Pimentel said were formed, armed and trained by the Philippine Army for its counter-insurgency operations against the New People’s Army. Alcadev students and teachers later found Samarca dead in a room in the school, his throat slit and his heart pierced by a high caliber bullet. Campos was shot on his forehead in front of dozens of witnesses in a nearby basketball court while Sinzo was shot several times by the paramilitary force. “(We left our) Mapasu(-organized) communities because of the military belonging to the 36th and 75th Infantry Battalions, along with their bandits (Magahat/Bagani Forces),” Garay said. “Before dawn of September 1, they roused the residents from sleep. They first took Alcadev’s director, Sir Emok (Samarca’s nickname) and they killed him by slitting his throat. Then they herded Alcadev’s staff to the village center,” he said. Roxas then interrupted Garay and, with a pointed finger, challenged the journalists taking videos of the exchange. “Teka muna. (Wait.) Who are you?” Roxas said. He said Garay could be interviewed later but said he they were having a briefing so he could listen. A woman staff of Roxas then placed herself between Roxas and the journalists and waved her hands in front of the camera to stop the filming. 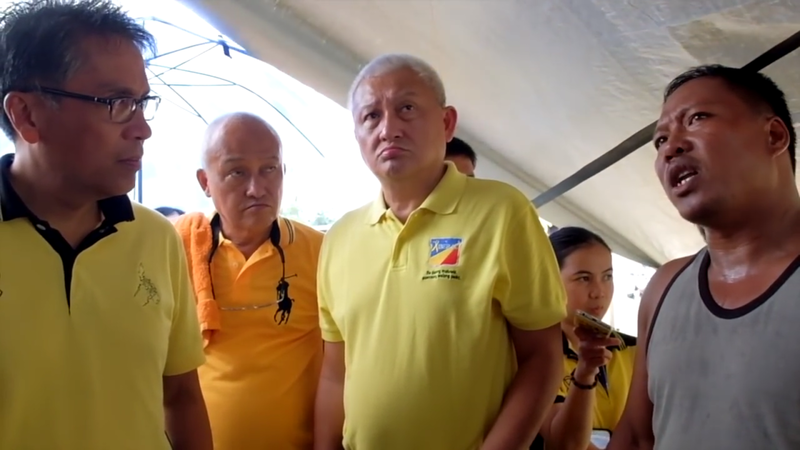 Roxas spent about 15 more minutes inside the tent, mostly by calling Social Work and Development secretary Dinky Soliman, Presidential Adviser on the Peace Process Teresita Deles and health secretary Janette Garin. He refused Pimentel’s offer for him to see more evacuees in the grandstands. In a brief interview with journalists after emerging from the tent, Roxas promised help for the evacuees in light of the emerging health concerns such as chicken pox. When asked about the evacuees' complaint about militarisation, Roxas echoed the police line that the perpetrators of the massacre were not members of the AFP. But when asked for his reaction to Pimentel’s repeated declaration that the Magahat/Bagani Forces were created by the military, Roxas said the matter should be left with the Philippine National Police, which he said was already conducting an investigation. He refused to answer the question about the fate of the Lumad schools as he beat a hasty retreat to have lunch with the local journalists before heading for Bislig City in the southern part of this province. United Church of Christ in the Philippines Bishop Modesto Villasanta for his part said Roxas should first help in disbanding the paramilitary groups. “The services these evacuees need are already being addressed by Governor Pimentel. But disarming and disbanding these groups as well as giving justice to the victims by apprehending the suspects is the best way the government could help,” Villasanta said. Surigao, like Agusan, is home to rich mineral reserves that lie within Lumad ancestral land. Some Lumads resist the entry of mining companies. However, mining companies can't operate on ancestral domain without written consent from the concerned Lumad group. Reports indicate this conflict led to the murders of Lumad leaders, allegedly perpetuated by mining companies themselves. Roxas, who owns stock in seven different mining companies, is a known supporter of the mining industry. Eric Gutierrez, one of his major campaign donors, is owner of SR Metals, a Manila-based mining company with operations in Agusan. (c) Kodao Productions; republished with additional content by Think Pinoy.